Writing the Arabic alphabet is pretty different from the Latin alphabet that English speakers are accustomed to. It looks very different, it’s written from right to left, and has 28 letters that are written differently depending on where they appear in a word. But don’t let that worry you! 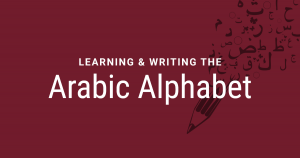 The Arabic alphabet is actually a lot easier to learn than you might think. It’s going to take some practice but if you understand a few of the basics, you’ll discover how simple it really is. When you write in Arabic, it’s normally done in a cursive/script form, meaning that almost all the letters are connected and flow into each other. The four different shapes exist to make it easier for that flow to happen. It may sound like a lot to learn, but once you get the hang of it, you’ll see how easy it is. The initial and medial shapes tend to be very similar and the isolation and final shapes resemble each other fairly closely, so it’s quite easy to learn the shapes and learn to connect the letters in different words. Write fluidly – Writing Arabic requires a smooth connection from one letter to the next, and that means a smooth and fluid writing style. Practice writing letters and words without lifting the pen. Just keep moving from one letter to the next without interruption. Proper form – You can improve the fluidity of your writing by holding the pen in your finger tips for better control. This can also help improve your control for the finer details of each letter. Writing from right to left – This is usually the biggest change for people who are accustomed to the Latin alphabet and will require the most practice. Practice pushing the pen from the right side to the left (or vice versa if you’re left handed) and start developing new muscle memory. So, the best way to make the Arabic alphabet your own is to invest time practicing the shape of each letter over and over again. This will develop the necessary muscle memory to write each letter without having to think about it. As you follow the patterns for each letter, use the proper stroke order, trying not to lift your pen while writing. This will help you get used to the script style writing that is necessary with the alphabet. Start with the basic shape and complete the strokes that are all together. Then place any additional dots or strokes. Just like the strokes, these extra dots and lines should be placed from right to left. The next step is to start tying the letters together to make words. Practice using each letter in different positions in different words so you get used to using each form. Is all this time necessary? Doesn’t everyone just use Arabic keyboards to write things out? Well, yes. Once you’ve memorized the alphabet, you could just write your words with a keyboard. However, writing each letter as you learn them will help you internalize the alphabet much more – which will be a lot more beneficial in the long run. When you start learning how to write the Arabic alphabet early on, it can help your overall Arabic language skills, too. Yes, you could start learning to speak Arabic by using the phonetic sounds in the alphabet you already know. However, if you really want to start embracing the language, learning to write the words in Arabic as you learn a new vocabulary can be very beneficial. Enroll today in our online Arabic lessons and dive right into our detailed, interactive courses. 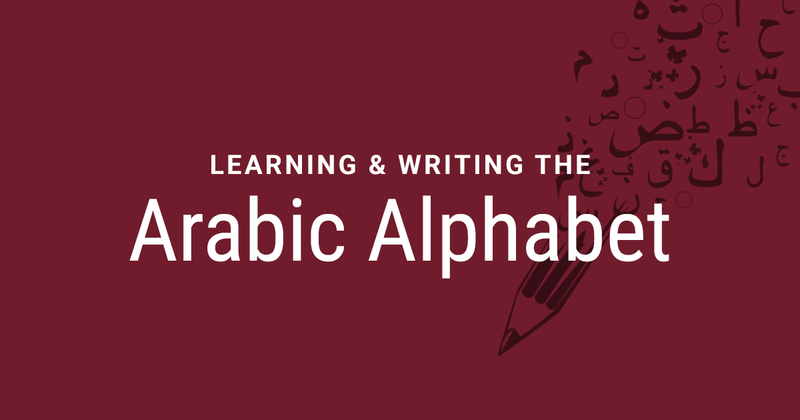 The Arabic alphabet is really quite simple to learn, as long as you have a dedicated teacher right there to help you through the whole process. Our program is designed to help you start writing and speaking as soon as possible.